If you're looking to do something different this year for your turkey, I highly recommend the Caja China box. Known as the "magic" box, it's most often used to roast a whole pig but it works incredibly well for a turkey. 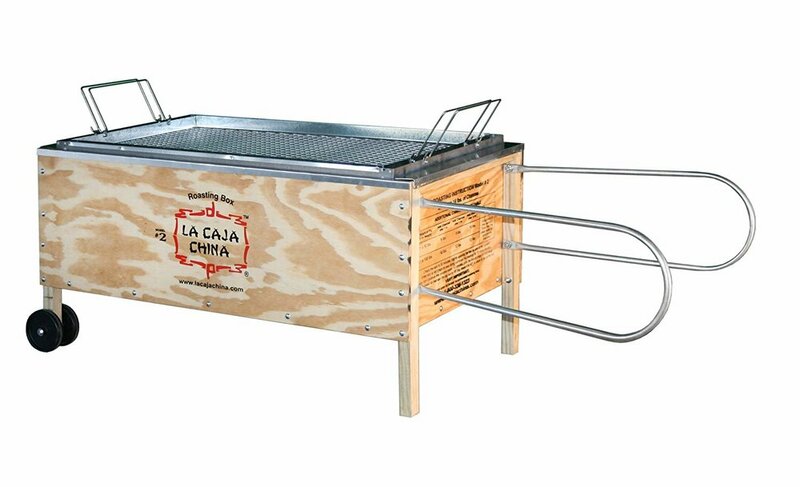 The Caja China originated in the Little Havana neighborhood in Miami. One year I was cooking a Friendsgiving and my oven went out. I had only a few hours before everyone arrived, so I wheeled my Caja China box out of the garage and built a fire. The near disaster turned into one of the best turkeys I'd ever made. The box is very simple to use. Put the turkey in a disposable aluminum pan, place it inside the box, put the lid on, and build a charcoal fire on top. You will need to replenish the charcoal a couple of times. The cook time is much less than the conventional oven as well. It only takes about 90 minutes to 2 hours. This recipe is inspired by the Cuban-style roast pigs that are injected with a mojo mixture. You can use any type of injection you like or skip the entire step. If you don’t have an injector, I highly recommend purchasing one (they are inexpensive and easy to find). You can use it to inject roast as well, and it will make a big difference. And if you don’t have a Caja China, just roast the turkey in the oven (but seriously, consider a Caja China!). Pat the turkey dry with paper towels. Combine the rub ingredients in a small bowl and rub the turkey with the mixture on the inside and outside. Make the marinade: Put all the marinade ingredients in a blender and blend to combine. Fill an injector with the mixture and inject the turkey all over. It will plump with the fluid. Place the turkey, breast side down, in a disposable aluminum pan. Put the pan inside the Caja China box. Place the lid tray in position and build a charcoal fire in the tray (I use a chimney starter to make this easy). Roast the turkey in the box (no peeking!) for 1 1/2 hours, continuously adding charcoal as it burns out. You will use about 8lbs (3.6kg) of charcoal per hour. While the turkey is roasting, make the marmalade: In a medium saucepan over medium-high heat, whisk the orange juice, vinegar, 2 tablespoon water, and the brown sugar until the sugar dissolves. Add the pineapple, onion and jalapeno. Bring to a low boil, then reduce the heat to simmer. Simmer, stirring occasionally, until the mixture has thickened, about 15 to 30 minutes. Season to taste with salt and pepper. Carefully remove the lid from the Caja China (have a safe place to set it down, as the charcoal is still burning on top). Use tongs to flip the turkey breast side up. Replace the lid and allow the turkey to roast for another 40 minutes, until the internal temperature of the thigh meat reaches at least 165 degrees F (75 degrees C). Remove the turkey and tent it with foil for 15 minutes. Slice and serve on buns if desired, with pan juices and pineapple marmalade. WATCH KATIE LEE EATS MEAT IN SWEATS!